The need to translate from one language to another is growing as businesses go global and the translation business is exploding. 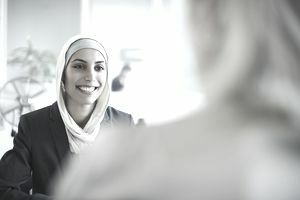 If you’re fluent in another language and are interested in working as a translator, you’ll need to know how to answer interview questions specifically about a translator job. Translators have many options for work in the field, from participating in virtual conference calls to translating documents and recordings, subtitling movies, or working in courtrooms or hospitals. Spanish is the language most in-demand, followed by Japanese, Korean, Chinese, and French. Translators can have flexible schedules albeit with tight deadlines, and with sites like Gengo (featuring international clientele), Translatorcafe and Verbalizeit, you can choose projects that match your skill and fit your calendar. Translators work in a variety of fields including education, law, literary, science, and technology. Many translators may work full-time jobs, some work part-time, and some translators are freelancers who work within their own schedules. Another job that’s similar to translating, and requires the ability to translate, is called "Transcreating,” and in fact, it may also be a component of a translating job. Transcreating is a mix of translating and copywriting with a local focus to adapt text culturally and linguistically to the audience. Essentially, a transcreator needs to be able to not only translate the spoken or written words but needs to tweak the language to get the point across. This isn’t always easy since different languages, or even different dialects of languages have words, expressions, and phrases that just don’t match perfectly to English words. If you’ve applied for a job and are waiting for your interview, it may help to review some questions, so you can get an idea of how to answer them. Here are some typical questions you'll encounter in an interview about your experience and more. Do you have a certain area of specialization or do you work on generic translation projects of many types? Do you hold any translation certifications? What kind of training do you partake in to continue to improve your skills? Have you trained fields relevant to interpreting work (e.g., medical, legal, social work, education)? Would you ever want to work on your own and start your own freelance translation business or translation agency? Why did you decide to become an interpreter? What kinds of people do you have the most difficulty working with? What type of ethical dilemmas have you encountered as a translator and how did you deal with those? What would you do if you were interpreting and a person said something that you did not agree with or found upsetting? When you are interpreting, do you attempt to establish a rapport with the person or do you prefer to keep the relationship formal and more detached? What types of ethical dilemmas have you encountered and how did you resolve them? How well can you understand different dialects and accents? How do you handle body language and gestures which are not understood by another person with a different cultural background? How do you handle a situation when you didn't hear exactly what was said but you understand the general gist? Do you try to translate every single word or idea expressed, or do you try to summarize what was said? What would you do if you made a mistake in translation or did not understand a term? How do you prepare for an interpretation session? Do you translate every word verbatim or offer a summary? Now that you have a good idea of what types of questions to expect, take some time to craft your own possible answers so you can be prepared for your interview. Practice saying them out loud, so you’ll feel more comfortable and confident during your actual interview. If, by chance, you have a friend, colleague, or family member willing to pose as an interviewer, have him or her ask you these questions so you can get even more practice before your actual interview.